The Patrick Geddes Centre has now been open for about a year in the carefully restored Riddle’s Court in the Old Town. The purpose of the Centre is to promote awareness of the life and ideas of Patrick Geddes, which it does through a seasonal programme of cultural and learning events for adults and children. 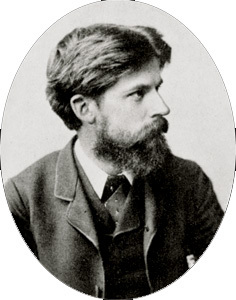 Sir Patrick Geddes (1854-1932) is best remembered as a town planner and sociologist who virtually founded modern town planning in Britain. However, he was an innovative polymath of many interests and achievements who held a chair in botany at the University of Dundee for thirty years. The Patrick Geddes Centre occupies part of Riddle’s Court, a merchant’s house dating from the 1590s and located just off the Lawnmarket. The building has seen various uses over the years and in the late nineteenth century Geddes converted it into Edinburgh University’s first Hall of Residence. It is now a Category A listed building with exquisite painted and plastered ceilings, panelled rooms and working fireplaces. It has recently been painstakingly restored and in addition to meeting rooms and other facilities there is a cafe. As well as running events the Patrick Geddes Centre offers guided tours of Riddle’s Court and the surrounding parts of the Old Town. The tours cost £12 (£9 concessions) and have a duration of 60-75 minutes. Pre-booking is necessary. Further information is available from the Patrick Geddes Centreand Riddle’s Court Web sites, by e-mail (info@shbt.org.uk) or telephone (0131 510 8789). The Postal address is: Patrick Geddes Centre, Riddle’s Court, 322 Lawnmarket, Edinburgh EH1 2PG. The Riddle’s Court opening times are 9:00 am to 5:00 pm on weekdays.